Scale Auto Article Set! Yahoo! I’m a confirmed fanatic about Darryl Starbird’s famed Predicta show car and a deep fan of Darryl. From the time that I first saw the car in a 1960 issue of Car Craft that my dad bought for me (I was just nine at the time, and already smitten with custom cars), to the first of many Monogram Predicta kits I purchased from K-Fisher Drug — a cozy neighborhood drug and small general store in Holladay, Utah that carried model car kits during my Eighth Grade school year in 1964 — I have fantasized about this car! I have great childhood memories of building a handful of the Predicta kits (all built poorly) in the eighth grade: That wasn’t a particularly happy year for me, and I distracted myself by building Predicta models, and reading Darryl Starbird’s and Tom Daniel’s articles on how to “customize”(!) a Predicta model. Clearly, I was hooked at an early date. As I grew up, perhaps oddly, my pre-occupation with Starbird’s signature car only became more acute, and poignant, and certainly more sophisticated as the years went on. Against the background of a very successful legal career of nearly 38 years, a great wife, three terrific children, wonderful daughters-in-law, and four grand kids (so far! ), there’s always been the Predicta — the car has been a cheerful and chimeric talisman of innocence, excitement, and deep meaning to me. I don’t want to know what a psychologist would think about all of this… and I don’t care. As acknowledged by Street Rodder and Car Culture Deluxe in 2009, Darryl Starbird’s Predicta is not just an icon of the custom car hobby, but its developing design evolution since 1960 has produced a graceful, “space-age” car that knows no era. Few other historic customs have fared as well. In an age of too much gorp, Starbird’s signature car stood nearly alone as a highly-styled, elegant automotive design. In my book and on this site, you can learn about and enjoy this incredible car! The Predicta Project will allow the interested reader, and the custom car/model historian, to fully enjoy the history of a remarkable restyled “futuristic” automobileand to consider what might have been and this Project will result in the construction of kits that might have been — could have been — if things had been different. This Project will be a major effort that will stretch across several literary and scale modeling disciplines to report on, discuss, speculate upon, and display in miniature the most famous of all bubble-topped custom cars — all in an historic setting. 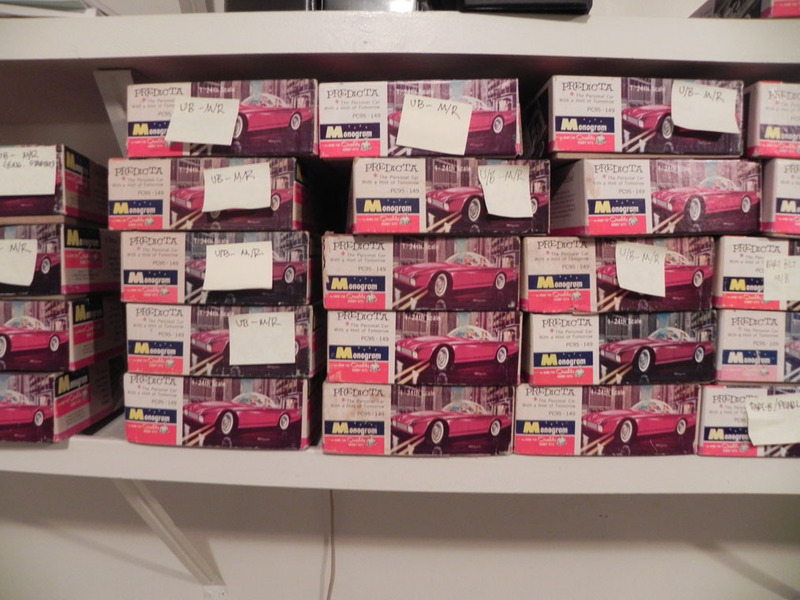 While the principal goal of The Predicta Project is to chronicle, preserve and pass along the wonderful history of this car (including model car kit “history”) might have been different if some key events been altered – all of which might have plausibly happened had just a couple of decisions been made differently at Monogram. History and fiction will cheerfully embrace the two phantom scale model kits and models we’ll build, and in the accompanying phantom artifacts and ephemera we’ll be creating. What a magnificent obsession this car has been in my life – and I’ve loved every minute and every one of the dollars invested in pursuing this Project! I’ve collected many dozens of vintage kits over the last thirty years and, in the process, I’ve collected not less than eight of the very rare metallic red issue versions of the kit. This rapacious goal to acquire (some by trading) many vintage kits led to my earlier acquisition of several examples of the 1964-1966 kits that precipitated my discovery of the scandalous Kelly Springfield Tire promotional program. The entirety of the Predicta Project will take some years to complete, but all things worth doing are worth doing right (as my dad taught me). Jump to the brief history of the car. Learn about the scale models and phantom kits that will be created in the Gustavson Mysterium. Check out a few built-up models of the car, some of which are quite creative! Come back often for updates to this site. Long live the Predicta and this Project! Copyright © 2019 The Predicta Project. Powered by WordPress and Saga.